Beta Wolf is: Grant Arnow on vocals, Devon Pangle on guitar, Sergio Ruelas on guitar, Chester Lang on drums, and Rocko McIvor on bass. Q. You’re currently on tour with Daughtry. How are you enjoying it? Grant Arnow: It’s great, it’s awesome. Chris Daughtry is really accommodating. Everybody is really welcoming and excited about us being on this tour. I mean, Chris and the rest of his band have been on the side of the stage every night watching us. His fans are really passionate about his music. I’ve experienced other tours where the fans of the headliner aren’t as excited to see the opening band. But with this tour in particular, they’re really excited to see us. They’ve been very welcoming to us. Q. You’re music is really good. The guitar and drums are just amazing. Can you tell me about your band members, their backgrounds, and how you came together? Grant: Yeah, absolutely. Sergio Ruelas our lead guitarist, and I were in a band prior to Beta Wolf called Takota, that was signed to Island Def Jam. We signed and just got caught up in the usual situation with a lot of rock bands, that we made a record for 3 years and by the end of it, it was sort of decaying in on itself. So as that band fell apart, he and I were really committed to building a band that we had wanted to be in since we were 11 years old. So we retreated back to Los Angeles and sort of hunted around for the perfect other members. Sergio grew up playing guitar in a lot of community bands around his area, and he definitely has an influence that originated from Mexican-American and Latin-American music. We found Devon Pangle, our rhythm guitarist, he was a transplant from El Paso, Texas, and a graduate of the Musicians Institute. He’s really good about figuring out unique ways to play the instrument. You know, it’s one thing just to play basic chords, but Devon is intent on making sure that he doesn’t do anything the easy way. Chester Lang, our drummer, I had heard about him through a lot of different places. We met him through the Viper Room. Chester is amazing. He also went to Musicians Institute and he grew up in the central coast around San Luis Obispo. He’s a powerhouse drummer. And we wanted somebody that was creative, you know. With all of us, we wanted uniqueness to each of the instruments. We knew that if we found people that were unique in their own regard, and we focused on becoming a family, that the sound of the band would be unique amongst all the million rock bands in the world. He’s a really creative, powerful, excited drummer. He’s devoted to developing himself. And then the last addition was Rocko McIvor. He’s our bass player. He had been playing with this band called the Devil’s Orchestra that are well known around Los Angeles. Rocko brings a level of energy to our live shows that is really special and I think it’s a big strength of ours. But also he’s a really well-versed bass player. So the first 3 months of the band we were in a rehearsal space focused on trying to find our sound. We didn’t want to just play rock songs. We wanted to have something that sounded unique. We pushed and perspired. I think we’re really excited about the results of that. Because I think rock music today is not the most popular genre. I’ve got lots of friends that are jumping on the DJ bandwagon. And I think it takes real courage to say not only I want to be in a rock band, but I want to do something unique with rock n’ roll. Because I feel like people have moved onto other genres. It’s not that they’ve lost interest in rock, but I think that they feel that they’ve seen all that rock can deliver at this point. We’re focused on having something that’s fresh and unique, that’s worth people spending their money on. Q. I read that your favorite songwriter is Bruce Springsteen. What is it about his songwriting that you like so much? Grant: There’s a lot. The first thing is, you know, Bruce Springsteen’s use of language is never beyond the capability of any one person to understand. You don’t have to feel like you need to take a class in college to understand what he’s talking about. He writes in an every-man sort of language. And I appreciate that because then he takes the experience of working people, and people that are struggling, and young love, and he wraps it up in a way that is so profound yet so simple. In terms of poetry, anybody can get caught up in the use of words. But it takes somebody to really deliver a message that’s clear and succinct and make it beautiful. With every one of his songs, and I have my favorites, but at this point I would argue that any one of his songs lays a message out there that’s so clearly defined that a 3-year-old can understand it, but so deeply nuanced and powerfully emotional that anyone can find themselves within the story of the song. And I think when you do that correctly, you have something that transcends age groups or race or socio-economic demographics. You have something that is truly powerful and moving. Bob Marley is the same way. It’s a simple notion and it’s delivered in such a beautiful package that you can’t deny how emotional and moving it is. I love the simplicity of Bruce Springsteen, I love his desire to really get in the heads of the people that he writes about, and I love the way that it sounds when he sings it. Q. When you’re about to go onstage, what’s going through your mind? Grant: I kind of refer to it the same way, I think, a surfer would approach riding a wave. You kind of have to sit and watch it for a second. So I look at the way the seating arrangement is laid out, I look at the size of the stage, I get a sense of the placement of the speakers. With the crowd, I gauge who they are and I try to get a sense of what would move them. You can’t play each show exactly the same. You would run the risk of your message going over the tops of your audience’s head. I don’t’ want to play through an audience. I want to engage and play with an audience, you know. So I try to figure out the best way to approach that. And then I try to let it go. I don’t want to overthink as I’m walking on the stage, and I don’t want to try so hard that I lose sight of the fact that it’s a visceral, emotional thing, performing in front of an audience. I need to tap into the root of why I started doing this when I was a child, and engage that. And when I can figure out how to shake each person out of their chair and make sure that they’re experiencing the emotion that I’m putting out there, that’s when I feel a show is really impacted. You want to feel like it’s a symbiosis. The energy that I’m putting out is being reciprocated from the audience, and then I send it back out, and they send it back to me again. Q. 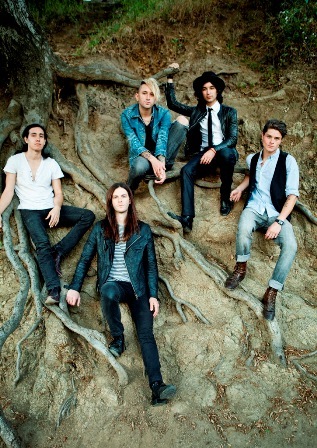 On the cover of your new EP you all are sitting on giant awesome tree roots. Where was that picture taken? Grant: It was taken at Griffith Park Observatory. If you’re at the observatory, and you’re facing it, if you go to the right you’ll see a pathway that leads down into the canyon. And as we were walking we saw those roots. Not to sound cheesy, but we liked the fact that it’s sort of a mixture of metaphors. Here we are in Los Angeles, which is really urban, and then this is one location that totally bucks that trend. It’s not urban, it’s out in the middle of the organic country. And you see the roots of this tree growing down into the hillside. For us, we’re heavily rooted in the City of Los Angeles, and you’re right under this iconic observatory that’s been featured in a million different snapshots of L.A., and here we are at the base of that, looking at these roots. I mean, it was important for us to take a picture there. But we didn’t plan it. We just walked by and thought it looked cool and when we saw the picture we started thinking about all the reasons why it was really special. Q. You have a song on your new EP called “Los Angeles.” It’s an ode to the city. What advice would you give to anyone wanting to move to Los Angeles to pursue their dreams? Grant: That’s a great question. The first thing I would say is, you know, if you could be happy in life doing anything other than pursuing your dream, if you could truly look in on yourself and think “I can probably be happy doing something else,” then you should do it. Because moving to L.A. will test every fiber of your conviction. It’s not for the faint of heart. L.A. is expensive, it’s a struggle. There are more neighborhoods that you wouldn’t want to live in, and the neighborhoods that you would want to live in are expensive and don’t have a lot of space. We practice in North Hollywood. And before I moved to Los Angeles, more than a year ago, I was driving from Orange County five nights a week and driving hours back and forth. It wouldn’t have been possible for me to sustain that. But not playing music would be like cutting off one of my legs. I wouldn’t be able to live that way. I would say, look, if you’re really serious about this, if you believe in it, then put everything you have in it, don’t rest, don’t stop, don’t take a day off. Because if you take a day off then the person in the rehearsal space next to you, or the big actor that’s going out for the part that you’re about to audition for, they are not going to take a day off and they’re gonna get it, based on the fact that they’re working harder than you are. So recognize that it all comes down to you. No matter what anyone ever says. Any manager, any record label, any booking agent, anybody. At the end of the day, your success is 100% determined by your determination. Q. You released Dark Days last October 2011. How do you think you’ve grown as an artist over the past year? Grant: When we were doing Dark Days, I was personally in a really dark place. It’s like emerging from a cave. Those first 3 or 4 months that we were in the rehearsal studio trying to fight it out, figure out what band we were. No one knows what you are doing, no one has heard your music yet. No one has responded in any way. So you are alone with your emotions, and it can get kind of scary. Especially when you’re pursuing a career as an artist but you haven’t actually released any of your art. Since then, and since we went to Japan and had such a great response there, it puts fuel in your tank. It helps you to recognize that the work that you’re doing, that you value so much, is impacting other people. And that makes you more excited to explore things, you know, it helps us to have more resolve to go back in and do it again. … I think the development has been that we’ve grown as songwriters, that we’ve grown as a live band for sure, and it finally feels like – what’s the best way to put this? With Dark Days it feels like we were putting on a new pair of boots and we thought, okay, once we wear these boots they’re going to feel really conformable, but the moment you take your first step, you’re sort of nervous, you know. And now the boots are really worn in and we’re excited about what that’s gonna allow us to do for the next record, the one we just released and the next one that we make. Beta Wolff is amazing as a group and as individuals!!! Luv them!